Sometimes you may want to capture screenshot of a webpage for that special use. There are number of ways to do so. For starters, using PrintScreen function works the best. With webpage opened press the PrintScrn button (located on top right part of keyboard). Then open Microsoft Paint (Click on start, click on run, type mspaint, click on ok), then click on edit and click on paste option. 1. WebSnapr: Very handy and quick tool to capture webpages. Just enter the URL, select the size and click on capture. You will get image queued message, simply refresh the webpage by pressing F5, screenshot will appear! Besides, WebSnapr also offer number of plugins for wordpress, blogger and other add ons to have similar functionality on other platforms. 2. Thumbalizr: Incase you want to capture whole vertical scrolling webpage, then thumbalizr is the best option. Websnapr, only provide snapshot of currently viewable are and not the part hidden below. For this enter the URL of the webpage, select ‘page’ option and then click on ‘thumb it’. 3. ThumbnailsPRO: Another useful service for screen capture, however for free service you need to have backlink to the site and few other restrictions. They also offer paid service for screen capturing. 4. FireFox Plugins: You can use these useful Firefox plugins for screen capture. Picnik for Firefox, let you easily easily import a screenshot of the currently opened webpage into it, if you use online image editor Picnik. Save as image and Snissa are two other very useful Firefox plugins for screen cpature functionality. 5. Software Applications: There are number of screen capturing software avilable. You can install them and start capturing on the fly. 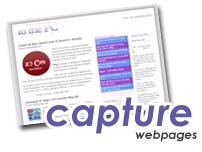 Websitescreenshots, TechSmith SnagIt, FastStone are few very popular screen capturing software being used. For MAC OS: Paparazzi, InstantShotÃ‚Â are well known for screen capturing functionality for MAC platform. Armed with above tools, you can capture webpage on a fly and with great ease. What say? What is Cost of Living & property in your country? I used WebsitesScreenshot component in my project. This library is also the good option for that. You can use abetaday.com and then share the screenshots with others. Merry Christmas & Happy New Year from Vietnam.